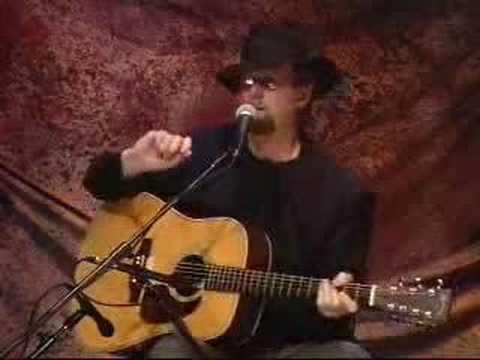 Roger McGuinn was born in 1942 and grew up in the Chicago area. His parents were journalists. They loved to read and were devoted to literary charities, even going so far as to have a book published. James Joseph McGuinn, his given name went to The Latin School of Chicago. He became bitten with the music bug after hearing Elvis Presley sing Heartbreak Hotel. He begged his parents for a guitar. Other childhood influences include Gene Vincent, Carl Perkins and the Everly Brothers. In 1957 McGuinn enrolled in Chicago’s Old Town School of Folk Music. It was there that he learned to play the five string banjo and got serious about playing guitar. By his graduation he was playing solo at various Chicago coffeehouses. 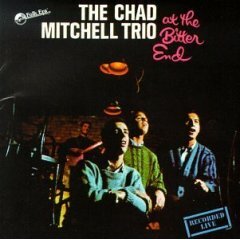 His influences included several trio vocal groups including the Limeliters and the Chad Mitchell Trio, a group which he would later become a member. 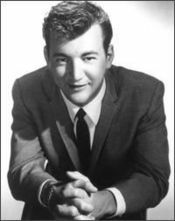 McGuinn got a job playing guitar and singing background in Bobby Darin’s band. 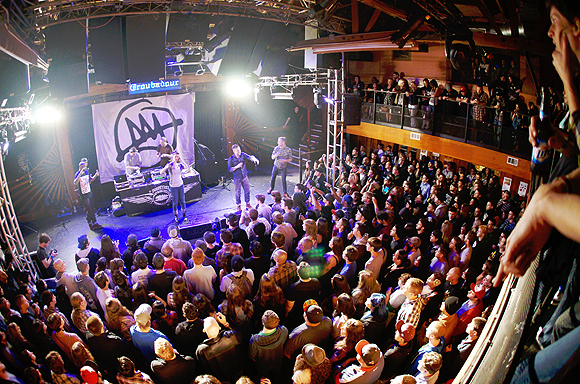 This job lead to him relocating to California and the Los Angeles music scene. 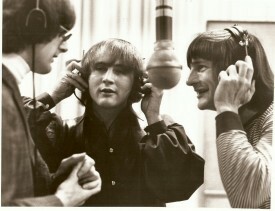 It was in Los Angeles that he met future members of the Byrds. In 1962 Darin hired McGuinn with the thought in mind that Darin wanted to add some folk music to his career. These were the years that Folk Music had significantly gained in popularity. By mid 1963, Darin’s health began to fail and he retired from singing. He opened a songwriting and publishing office in New York City’s Brill Building and hired Jim McGuinn. McGuinn also found work as a studio guitarist and that same year was backing up Judy Collins and Simon & Garfunkel on their recordings. The rumblings of Beatlemania and the British Invasion were about to take place. Within less than a year the Beatles American tour would commence. 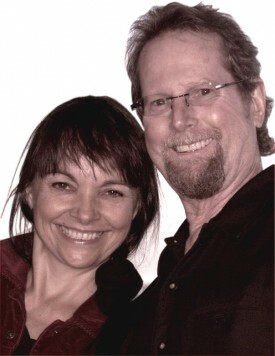 McGuinn traveled back to Los Angeles and took a job at Doug Weston’s The Troubadour. Jim McGuinns act included folks songs that were played in a rock style. This caught the attention of Gene Clark. Clark befriended McGuinn and thus was formed the beginnings of the Byrds. Eventually the duo found other like-mined folk/rock influenced member, Chris Hillman, David Crosby and Michael Clarke. The quintet began to perform at Los Angeles clubs. In January of 1965 they recorded the monster hit, Mr. Tambourine Man. The Byrds' version was much different than what the songs writer, Bob Dylan, had put down on vinyl. Their version began with an amazing four bar guitar intro and outro that was played on a Rickenbacker 12 string guitar. This was a fairly recent instrument at the time and provided a very unusual sound. Part of that sound was dependent on the engineers use of compression technology. Members of the Byrds were dismayed by the fact that the only group member playing an instrument on the recording was McGuinn. This was typical of most major recording sessions. Studio time was expensive and record companies wanted ‘product’ out as soon as possible. And this track was being done at Columbia Studios. Members of the Wrecking Crew were hired to play on the hit instead of The Byrds members. 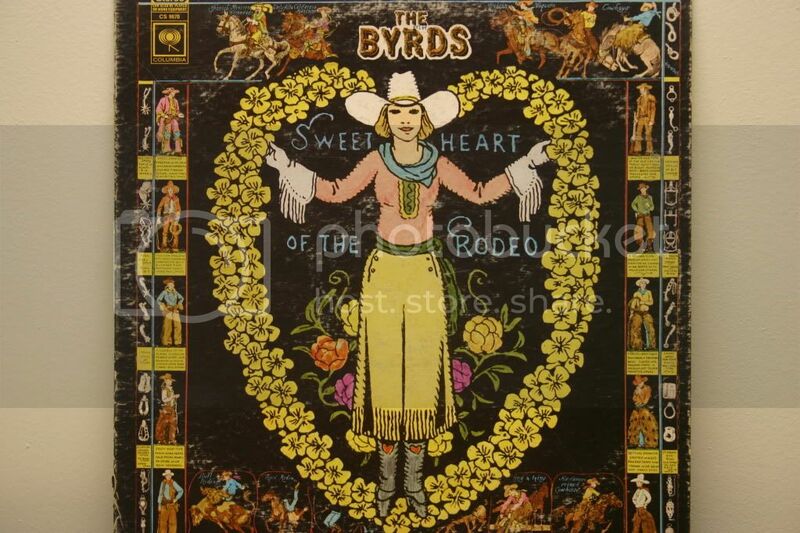 The Byrds did their own vocals with McGuinn singing lead. In McGuinn’s words, “The Rickenbacker 12 string by itself is kind of thuddy. It doesn’t ring. But if you add compression you get that longer sustain. I found this out by accident. The engineer, Ray Gerhardt would use compression on everything to protect his equipment from loud rock and roll. 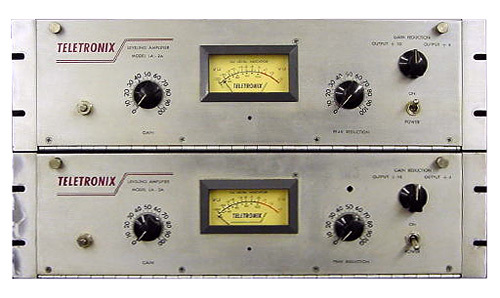 Two Teletronix LA-2A tube based compressors and the guitar signal was sent directly to the board. This came in handy with the Byrds next hit, Eight Miles High. It was in this song that Jim McGuinn attempted to emulate John Coltrane’s disconnected jazz riffs. He didn’t think this could be accomplished without such sustain. McGuinn goes on to say, “I practiced eight hours a day on that ‘Ric,’ which worked out well. 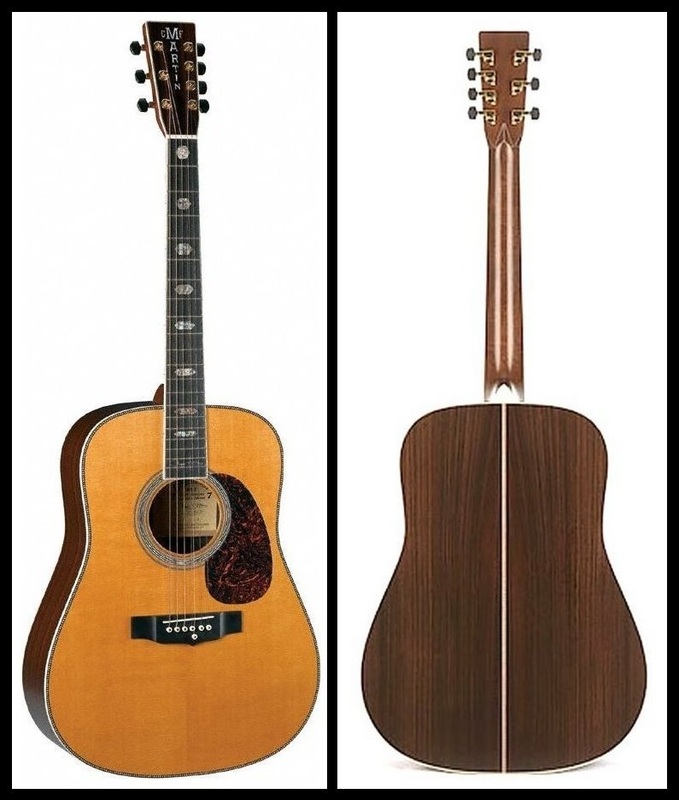 Acoustic 12 strings have wide necks and thicker strings that were spaced farther apart and were hard to play. But the Ric’s slim neck and low action let me explore jazz and blues scaled….I incorporated more hammer-ons and pull-off into my solos. I also translated some of my banjo picking techniques to the 12 string. 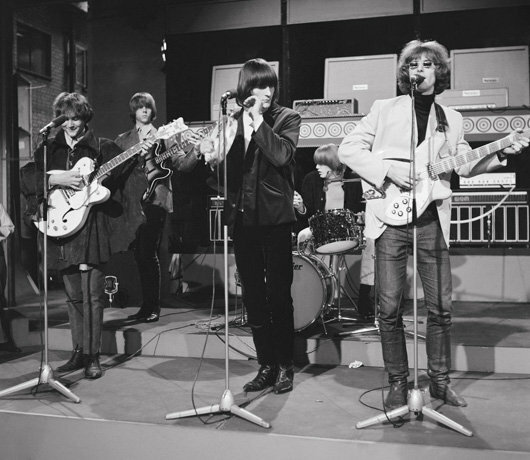 As a group the Byrds lasted two years, but played and recorded with other members and other differing names. The actual band officially called it quits in 1973. McGuinn went on to maintain an electric guitar band until 1981 when he decided to be a solo artist. 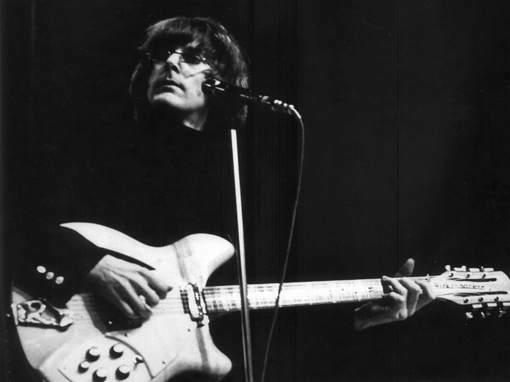 When James Joseph McGuinn started with the Byrds, he used his given nickname ‘Jim.’ Sometime in the mid 1960’s he started exploring spirituality and became involved with the Subud Spiritual Association. In 1967 the groups leader suggested if he was going to vibrate with the universe, he should consider a new name. As Roger was the one actual name and the 18th letter of the alphabet that air pilots use when talking on the radio, that was the name McGuinn chose. Since this time, ‘Roger’ McGuinn and his wife have become Christians, but he decided to keep the new name. McGuinn’s first Rickenbacker was a twopickup model 360-12 that had a beautiful blond finish. He was fascinated by the guitar George Harrison played in Hard Days Night. Harrison’s guitar was bound on the front and the back of the body. It was done in a yellow-to red sunburst finish that Rickenbacker calls Fireglo. 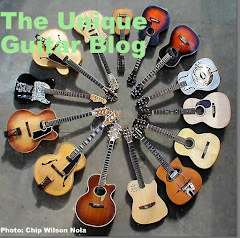 McGuinn could not find a Rickenbacker 12 string that had the pointier cutaways and top trim. He purchased the only available model and used it through his Byrds career. 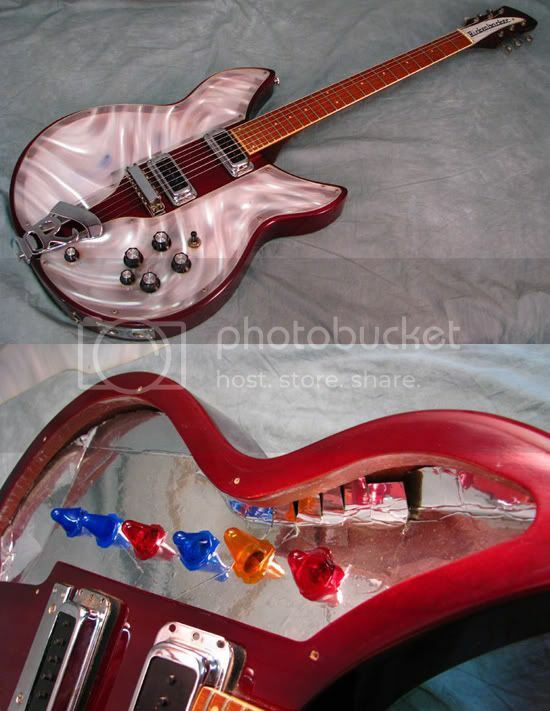 This guitar was stolen and when he replaced it with a similar instrument. He states that in later years it showed up at an auction and sold for $100,000. 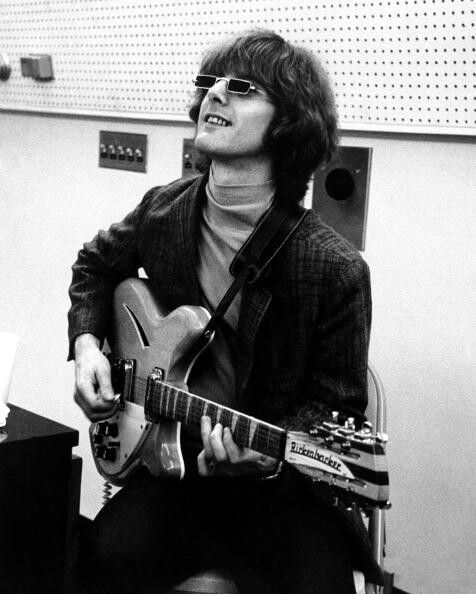 As he states, much of his sound is based on compression, for years Roger McGuinn was unable to replicate that sound on a live stage. Paul Kanter of the Jefferson Airplane suggest using a Vox Treble Booster. This was one of the first generation sound enhancers. The unit was small and plugged into a guitars input. McGuinn took the booster apart and installed in internally in his Rickenbacker. He states he tried other compression units, but could not get his sound until the Jangle-Box was invented. McGuinn states that he has since he currently has a built-in compression unit onboard his triple pickup Rickenbacker 370-12RM that was designed by engineer, Bob Desiderio. 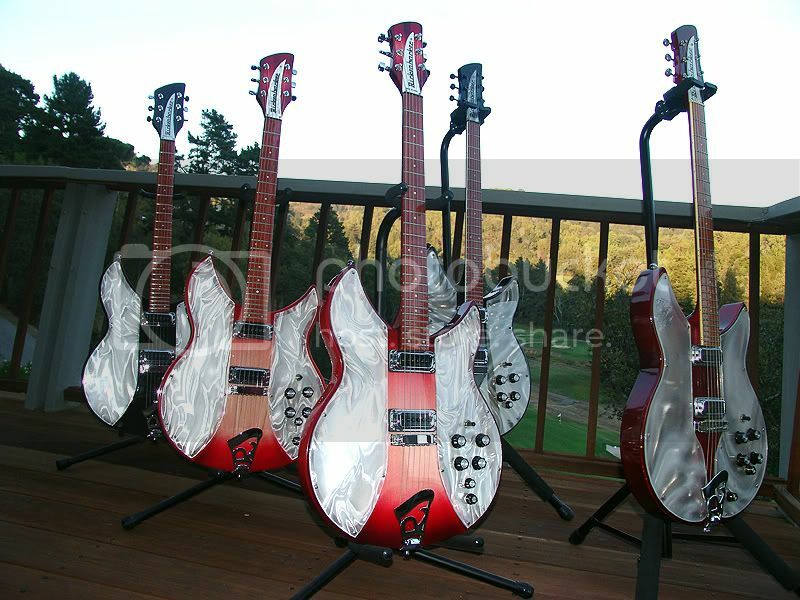 As an aside he states that John Hall, the owner of Rickenbacker, allowed 1000 370-12RM models to be built and will not produce anymore to preserve their value. McGuinn currently uses the Jangle Box and a Roland JC120 amplifier to achieve his sound. McGuinn does his own string changes and set up on his guitars. 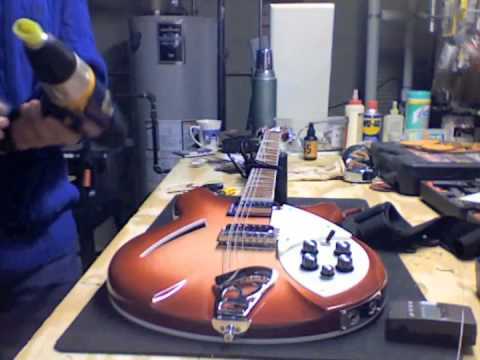 Changing strings on a Rickenbacker 12 can be an all day task. McGuinn has produced a video to show how he changes strings and also how he makes neck adjustments. Besides the Rickenbacker 370-12RM, McGuinn has other guitars he carries with him on tour. 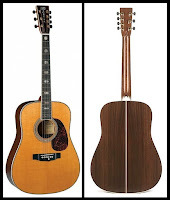 The Martin Guitar Company has produced and provided two Roger McGuinn models. The first is a D12-42/RM 12 string guitar. This is an exquisite 42 model Martin with all the bells and whistles. Alas, it is no longer in production. 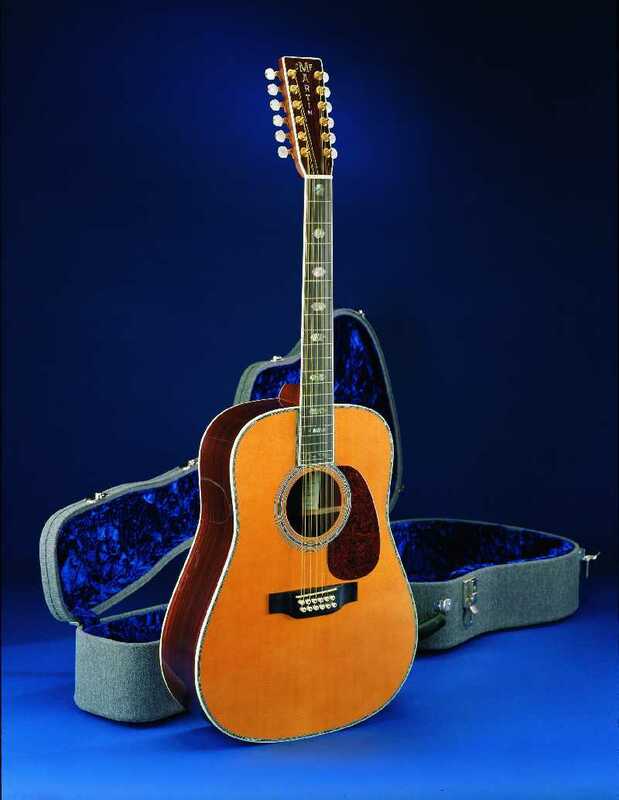 Martin also came out with a very unique model for McGuinn called the HD-7. This is a historic dreadnought style 45 Martin that has 7 strings. The unusual thing about this instrument is that an octave ‘G’ string is added to give the sound of a 12 string guitar, but the ease and convenience of a 6 string guitar. Roger frequently utilized single string runs to get his sound and this guitar does the trick. It too is no longer in production, but is still available through some major music stores. 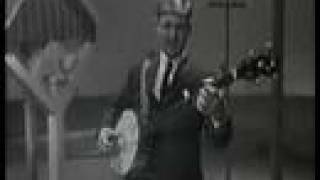 He was using a Fender Mastertone banjo that was given to him by Fender guitars when they were about to be acquired by CBS. He traded it to a friend for an old banjo that was made using Vega and Ode banjo parts. 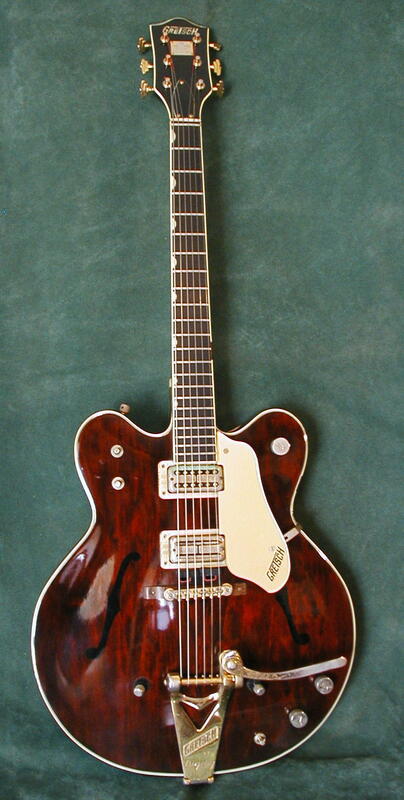 During his days with Sweethearts of the Rodeo, he used a Gretsch Country Gentleman. He did not think the Rickenbacker 12 would fit into Country Music. He states that he owns two Rickenbacker ‘Light Show’ guitars, but no longer takes them on the road. He owns a number of Rickenbacker guitars. 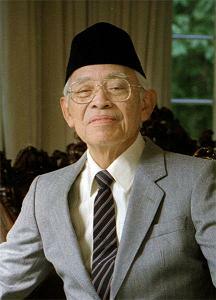 He also owns a Martin 00-21. Now in his 70’s, McGuinn only tours to theaters and performing arts centers stating they are well equipped facilities. He travels with his wife and enjoys getting in touch with fans all over the country. Roger is also part of a novelty band called the Rock Bottom Remainders. This is a group of writers, who would like to be musician and musicians and all are having a great time. The band was established by writer, producer and literary agent Kathi Kamen Goldmark. Over the years the Remainder has included among its members Dave Barry, Stephen King, Amy Tan, Cynthia Heimel, Sam Barry, Matt Groening, Greg Iles, Maya Angelou and Al Kooper. 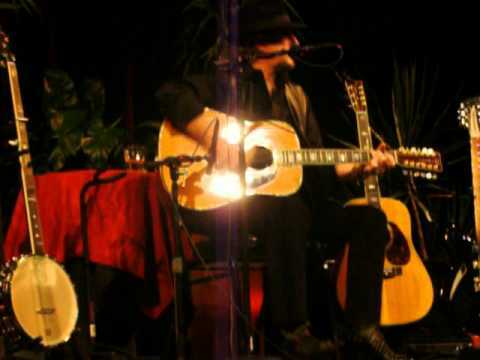 to Paul Simon and the other was Jim McGuinn, who changed his name to Roger McGuinn.